A perfect synergy of performance and style, the Street Rod pressure washer delivers the power you need to tackle any residential or commercial cleaning job. Putting the muscle behind the name is the proven strength of a GX200 engine from Honda and an axial pump from Annovi-Reverberi. Engineered for comfort and stability thanks to our anti-vibration system (PAVS), the ergonomic design includes a premium welded roll cage frame and oversized wheels for great maneuverability. PowerPlay washers can handle any cleaning job from siding and windows to stripping paint or power washing vehicles. Plus, an innovative motorsports-inspired chassis design gives this pressure washer a muscle car cool factor! 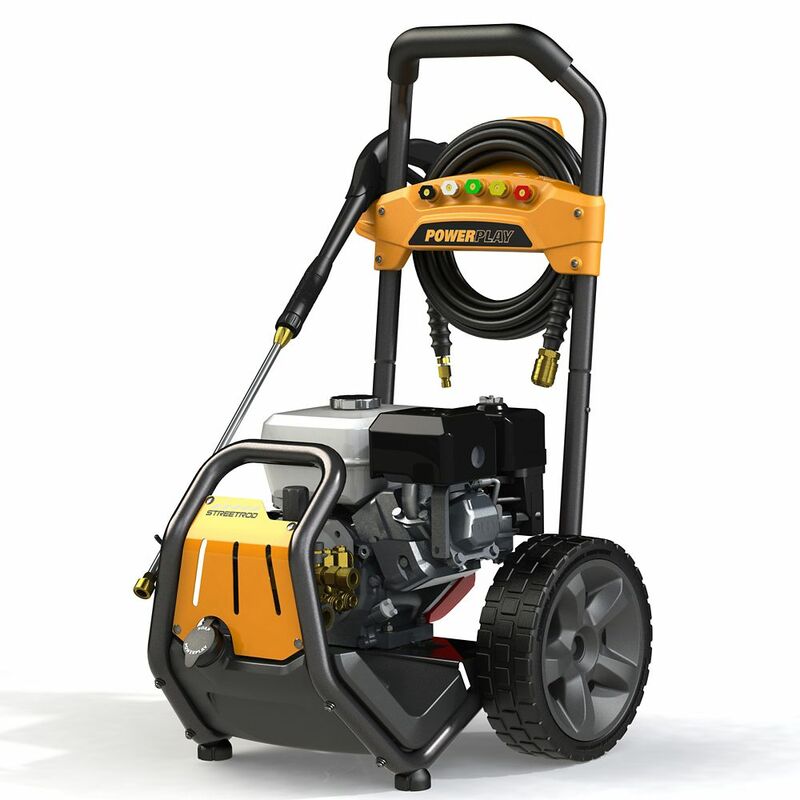 This pressure washer is ideal for cleaning driveways, building exteriors, animal pens, parking lots, and paint preparation. It comes with four quick-connect nozzles allowing you to choose the correct angle for your intended cleaning application. It also has a chemical injector to allow you to clean with soap. Clean up to 270 square feet, in fifteen minutes, with this cold water pressure washer. This unit is powered by a Honda GX200 gas engine and an Industrial-grade triplex pump, and includes a 25ft high pressure hose and spray gun. Karcher's G 3200 OH is a compact powerhouse that generates 3200 PSI and is powered by a reliable Honda GC190 engine. Equipped with a commercial-grade pump with brass head, durable welded frame, pneumatic tires with metal wheels and quick-connect fittings throughout, the G 3200 OH is a dedicated work horse that delivers on the Karcher Promise: Cleaner. Quicker. StreetRod 3300 PSI 2.7 GPM Gas Pressure Washer with Honda GX200 Engine A perfect synergy of performance and style, the Street Rod pressure washer delivers the power you need to tackle any residential or commercial cleaning job. Putting the muscle behind the name is the proven strength of a GX200 engine from Honda and an axial pump from Annovi-Reverberi. Engineered for comfort and stability thanks to our anti-vibration system (PAVS), the ergonomic design includes a premium welded roll cage frame and oversized wheels for great maneuverability. PowerPlay washers can handle any cleaning job from siding and windows to stripping paint or power washing vehicles. Plus, an innovative motorsports-inspired chassis design gives this pressure washer a muscle car cool factor! StreetRod 3300 PSI 2.7 GPM Gas Pressure Washer with Honda GX200 Engine is rated 4.8 out of 5 by 5. Rated 5 out of 5 by Denny from Very nice machine. Took a few minutes to put together and add oil. Put gas in it, choke on and p... Very nice machine. Took a few minutes to put together and add oil. Put gas in it, choke on and pulled rope, away it went. This machine has ungodly power at nozzle. Works very well at cleaning cement garage floors, sidewalks, patios and retaining walls. Hold on tight to wand and you will love it's performance. Manufacture of this machine has got a winner here. Rated 5 out of 5 by Bryanc from A dream machine Meets my expectations which were set high.a breeze to set up and use. Rated 4 out of 5 by Mike50 from Almost perfet... Order this pressure washer just a while ago and it performs great. Lots of pressure and the engine starts with one crank. Seems well made overall, but i am having an issue with the hose where it connects to the pressure wand. It leak right by the coupling from day one, and it is progressively getting worse. I am at the point where I either have to wear a rainsut when I use it, or just shorts and deal with getting wet. I will contact Home Depot to see how they deal with this and give a followup review. For now I can only give 4 stars because of this issue. Rated 5 out of 5 by JEEPMAN from Powerplay Streetrod Pressure Washer Purchased two weeks ago. Simple to assemble. Easy to start. Lots of pressure, soap and better than do-it-yourself car wash. Washed my home siding (great results) and our vehicles several times. Should pay for itself in one year with savings on home and auto cleaning. Rated 5 out of 5 by OJS1 from Solid unit with great build quality This unit is fantastic and works incredibly well. The build quality overall is very good and you can't really go wrong with a Honda engine. Powerplay has chosen a high quality pump which is pretty well regarded overall. The unit looks great and has a commanding presence. My only complaint is that the hose and water connections are located at the side vs the front. No unit I've seen really gets this quite right but having them on the side is a little annoying. If you are handy, these can be modified to have the water connection on the back and the hose on the front. I was very impressed to see the soap bucket with a drain plug which makes it easy to empty at the end of the season. Powerplay is a dumb name but otherwise this unit is well worth the cost.